THE security sector has long suffered from a shortage of guards. But, according to the Ministry of Home Affairs (MHA), there are nearly 30,000 guards, or almost half, who can work - but choose not to. As of July, there were 65,679 unarmed private security guards licensed by the police, but only about 36,000 are actively working as guards, the ministry told The Straits Times. In Singapore, demand for security services has been on the rise in recent years. About 50,000 guards are needed - which means there are 14,000 spots to fill just to meet demand, said Mr Robert Wiener, president of the Association of Certified Security Agencies. It represents about 70 of the 263 security companies here. Mr T. Mogan, president of the Security Association of Singapore, which represents about 150 companies, was surprised by the large number of guards who are qualified but have chosen not to stay in the line. "Even if only a fraction of them re-join us, it will ease the shortage of guards," he said. 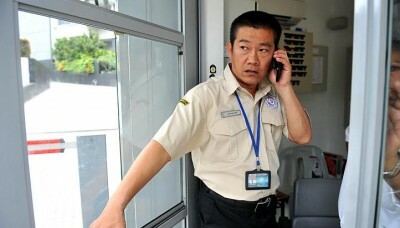 Since 2009, all security guards here attend compulsory training to earn a five-year licence. MHA said the five-year term is meant to persuade applicants to pursue a long-term career, but security companies here say that is not enough to make up for the long hours and low basic pay. Guards typically work 12-hour shifts each day, six days a week. According to the Manpower Ministry's (MOM) annual wages report, the median monthly basic pay for guards was $730 last year. With overtime, it can go up to $1,550. Interviews with more than 10 security companies threw up other reasons why guards quit: Harsh working conditions and a lack of respect for what they do. Security guard Lim Kok Hwa, 53, had a colleague from his previous company who walked out after working two hours at Plaza Singapura. "He couldn't take it because the job was tough - watching the taxi stand, handling delivery trucks and crowds," he said. Security company Soverus chief executive Paul Lim said guards leave when they feel that their work is not valued or respected by the public and their clients. Mr Govin Manu, operations director of security company Pedro, said some people may have quit because it was not their ideal job to begin with: "It is like taxi driving. Some take the (security) licence in case they lose their jobs." Agreeing, Mr Wiener noted that the 2009 compulsory licensing of guards coincided with the downturn: "Those who lost jobs became guards, but they stopped when the economy picked up. They are not coming back." MOM and MHA are working with unions and security associations to boost productivity and reduce overtime. An MOM spokesman said that talks are ongoing, and new measures would be rolled out where appropriate. One former guard who declined to be named said that since leaving the sector, he is earning more and working fewer hours. The 45-year-old, who earned $1,400 a month as a condominium guard, now earns $1,500 as a cleaning supervisor. He works eight hours a day, 51/2 days a week, compared to 12 hours, six days a week, as a guard in 2009. The father of two young children said, however, that he may put on his uniform again - if the pay and hours are better. "The 12-hour shifts must stop. It is too tiring, even with breaks."